Ruth Mitchell grins widely as her doctor walks into her kitchen and spots the recovering stroke victim faithfully following his prescription — raisin bran for breakfast. "That's great," exclaims Dr. Eric De Jonge as he wheels in his black bag, loaded not just with stethoscopes and shots but with miniature modern gadgets usually seen only in hospitals: a beeper-like pulse oximeter to measure the oxygen in Mitchell's blood, analyzers for on-the-spot blood testing, a plate-sized EKG machine. De Jonge and a team of geriatricians and nurse-practitioners are bringing old-fashioned house calls with a modern twist to impoverished streets in the nation's capital — targeting the hardest-to-treat Medicare patients, those with multiple chronic illnesses who can't or won't visit a doctor until they're so sick they show up at emergency rooms. De Jonge's records show regular health care in these patients' homes cuts expensive hospital stays and helps stroke victims like Mitchell stay out of even more costly nursing homes. It's a small but fledgling movement: Roughly 700 doctors around the country offer at least some house calls, says the American Academy of Home Care Physicians. They range from businesses that offer the wealthy convenience for an extra fee to doctors who say the huge needs of frail seniors can't be met during a 20-minute office visit, even if homebound patients could get there. 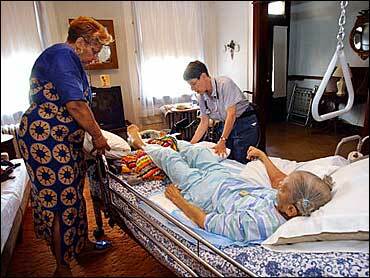 Such elder care is still rare; Medicare pays for about 1.5 million house calls a year. More rare are comprehensive programs like De Jonge's that bring special services — speech therapists, social workers to arrange Medicaid-funded aid, even portable X-rays and echocardiograms — into the living room any time of day. "It's difficult financially for physicians to do this, and many have never been trained" to do house calls, says AAHC executive director Constance Row. But De Jonge and Dr. George Taler contend the "Medical House Call" program they co-founded at Washington Hospital Center shows home care can be financially doable, even cost-saving, by better treating the 5 percent of Medicare patients who account for more than half the government program's spending. Preventing just one emergency-room visit, usually $2,000, can offset a year of Medicare-paid house calls for that patient, typically 16 house calls at $100 apiece, Taler says. When patients need hospitalization, they're admitted to the geriatrics wing, where De Jonge and Taler also care for inpatients and records of the 410 enrolled patients show the program has cut the average hospital stay by almost three days. It's not easy. Despite no rent and a hospital's backing, De Jonge and Taler needed major grants to start the program in 1999, and it took three years to break even. But they're now training other health workers to copy the system; one has begun in Cincinnati, and another starts this month in New York's Harlem. "This is for people who have a passion for the frail elderly," says De Jonge, who calls the long-term relationships formed during his hour-long house calls more emotionally fulfilling than office-based medicine. More than treating an ailment at a time, going into patients' homes let health workers see preventable problems they'd otherwise never know about and teach caregivers to cope. Take 94-year-old Magnolia Gordon, recuperating from a broken leg. Nurse-practitioner Jan Goldberg enters her hot living room and immediately notices Gordon's mouth is dry, an early warning sign of dehydration. Gordon is so sensitive to cold that she won't run her air conditioner. Goldberg gently lectures Gordon to run it at least a little each day and to drink more water, because life-threatening dehydration can hit the elderly swiftly. Then she spots brewing bed sores on Gordon's heels, and promises to send over a pressure-easing cushion. Gordon hadn't seen a doctor in 25 years until she broke a hip in March 2002. Patched up and sent home, Gordon refused to move in with her daughter, who could neither quit her job to provide full-time care nor afford a home nurse. Then someone suggested the house call program. First, social worker Jenna Green won Gordon a Medicaid waiver, available for certain low-income seniors, so she could hire a part-time health aide and avoid a nursing home. Another fall required a hospital trip for a broken leg, but other ailments — an arm infection, a minor fall one Saturday morning — were treated at home. "It has been a life raft for me," says Gordon's daughter, Sandra Armstrong. Across town, 82-year-old Mitchell totters to the couch where De Jonge waits to examine her. She's eating better and the blood pressure that caused a recent stroke is significantly better, the doctor sees with relief as he spells out a medication change to her husband. The stroke damaged Mitchell's vocal cords, and she painstakingly whispers, "When am I going to be well?" De Jonge squeezes her hand. "You may not get to run down Georgia Avenue by yourself, but you'll get to walking better and eating better," he promises.